The analysis of variance (ANOVA) model can be extended from making a comparison between multiple groups to take into account additional factors in an experiment. 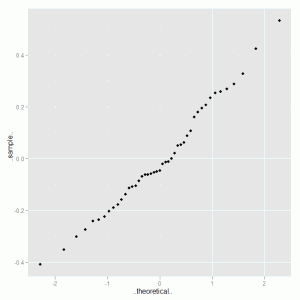 The simplest extension is from one-way to two-way ANOVA where a second factor is included in the model as well as a potential interaction between the two factors. 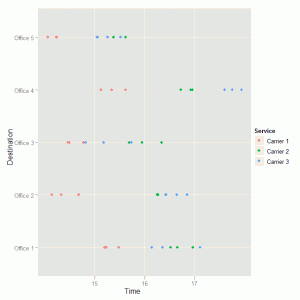 The data is then displayed using a dot plot for an initial visual investigation of any trends in delivery time between the three services and across the five sub-offices. 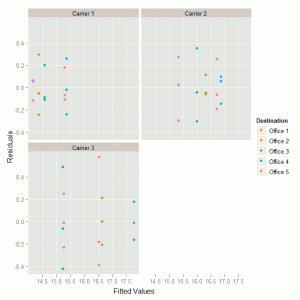 The colour aesthetic is used to distinguish between the three services in the plot. 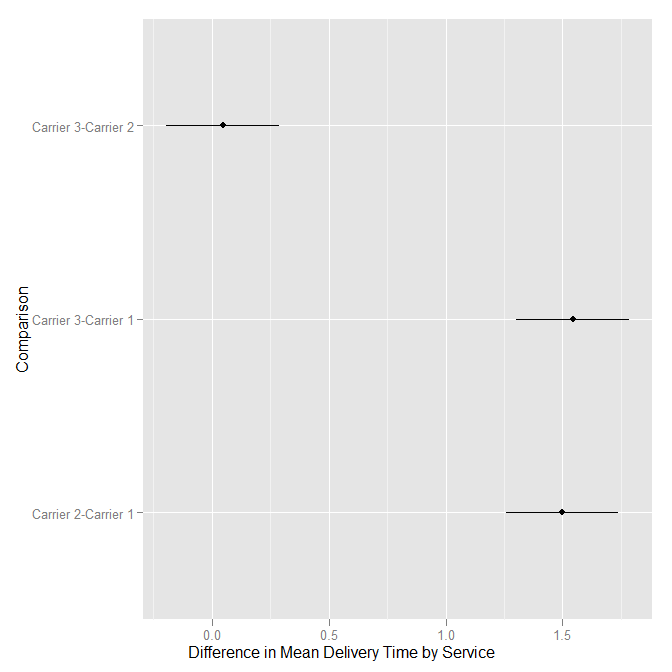 We have strong evidence here that there are differences between the three delivery services, between the five sub-office destinations and that there is an interaction between destination and service in line with what we saw in the original plot of the data. Now that we have fitted the model and identified the important factors we need to investigate the model diagnostics to ensure that the various assumptions are broadly valid. There are no obvious patterns in this plot that suggest problems with the two-way ANOVA model that we fitted to the data. 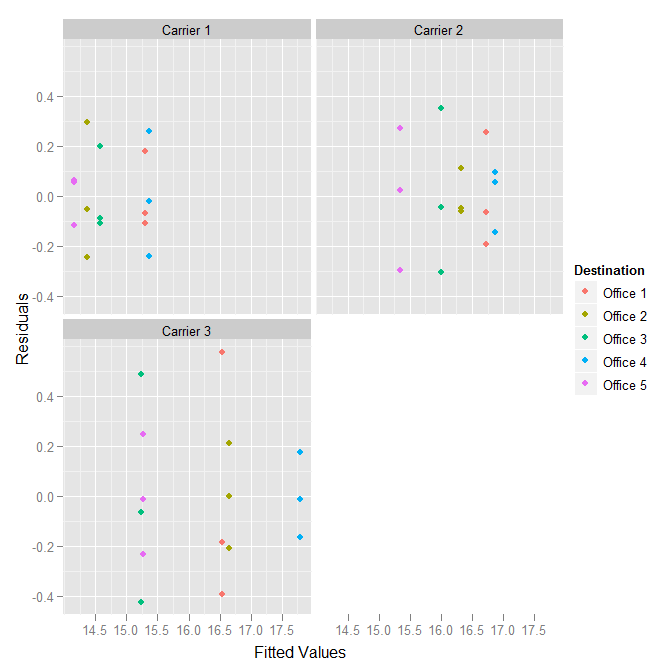 As an alternative display we could separate the residuals into destination sub-offices, where the facet_wrap() function instructs ggplot to create a separate display (panel) for each of the destinations. No obvious problems in this diagnostic plot. Again there is nothing substantial here to lead us to consider an alternative analysis. Even with the multiple comparison post-hoc adjustment there is very strong evidence for the differences that we have consistenly observed throughout the analysis. 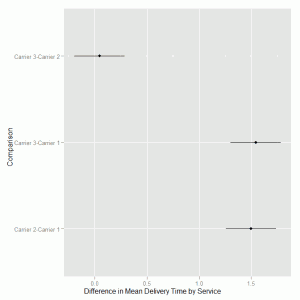 We can use ggplot to visualise the difference in mean delivery time for the services and the 95% confidence intervals on these differences. 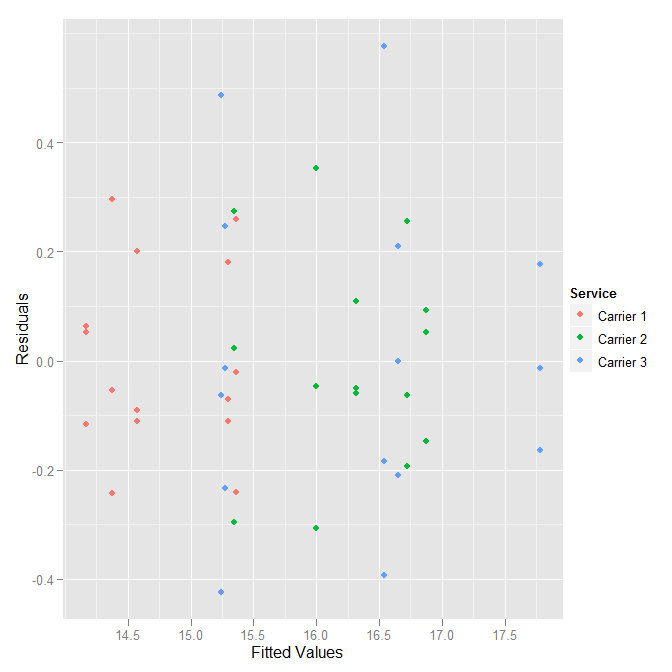 We create a data frame from the TukeyHSD output by extracting the component relating to the delivery service comparison and add the text labels by extracting the row names from the data frame. 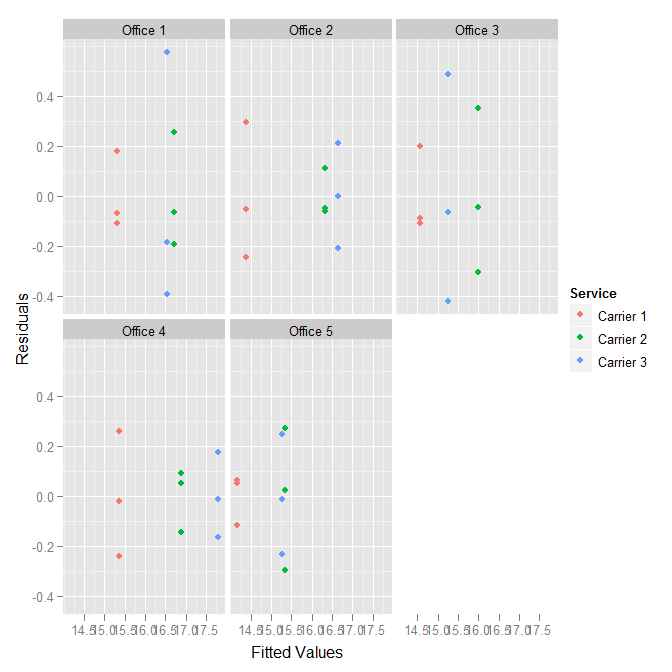 We then use the geom_pointrange() to specify lower, middle and upper values based on the three pairwise comparisons of interest. Daer this is great effort. i have some problems with ggplot. how could we install it and from where it is download. 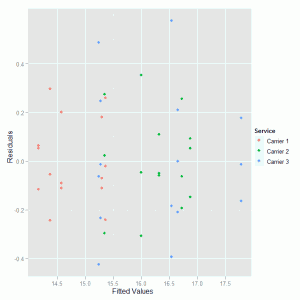 when i rum this line on R he answered and error in ggplot. The ggplot2 library can be downloaded from the R project website – http://www.r-project.org/ or if you have an internet connection on the machine where the R software is installed then, if you are using Windows, you can use the packages menu to install it. If you are going to manually download and install the package be aware that you will also need to get hold of the supporting packages and install them as well. Great walk-through of what I’ve been chasing; many thanks. 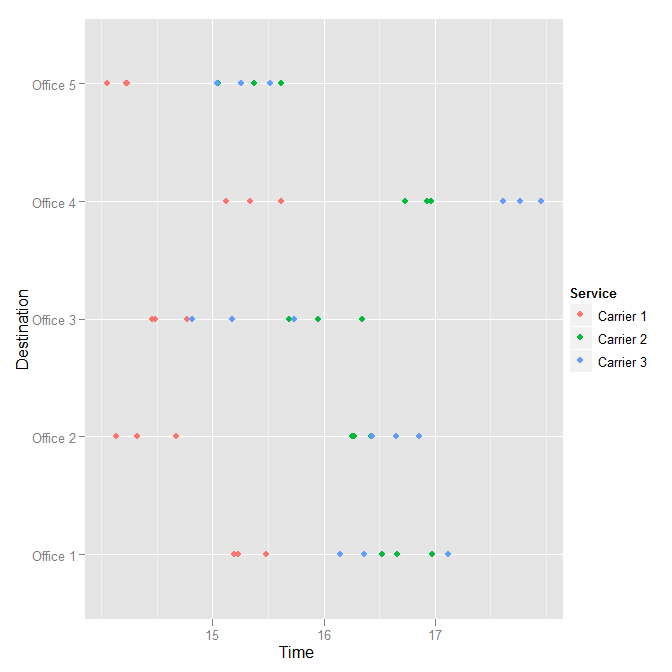 I’ve managed a mash-up to function fine with my data – however… how would you plot out just the different interactions between Destination and Service?